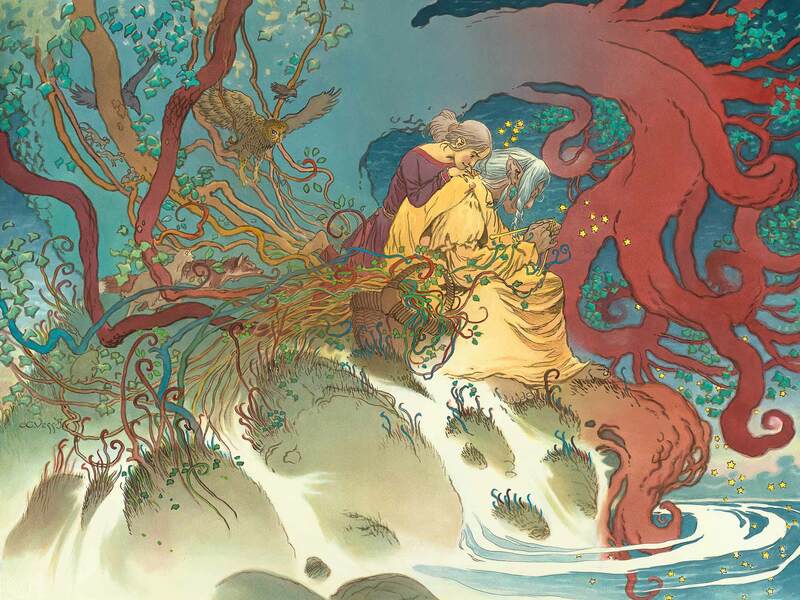 Charles Vess was born in 1951 in Lynchburg, VA, and has been drawing ever since he could grasp a crayon and crawl to the nearest wall. When Charles was a bit older he left the Crayolas behind and attended Virginia Commonwealth University, graduating in 1974 with a BFA. Afterwards, he worked in commercial animation for Candy Apple Productions in Richmond, VA, until moving to New York City in 1976. 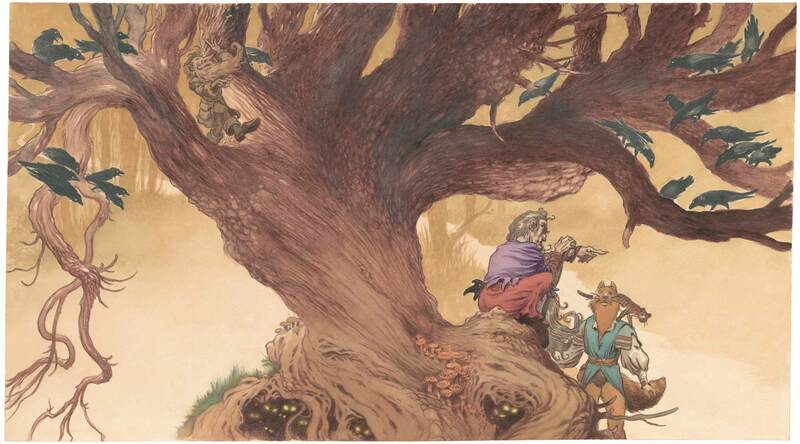 There he became a freelance illustrator, working for many publications including Heavy Metal, Klutz Press and National Lampoon. 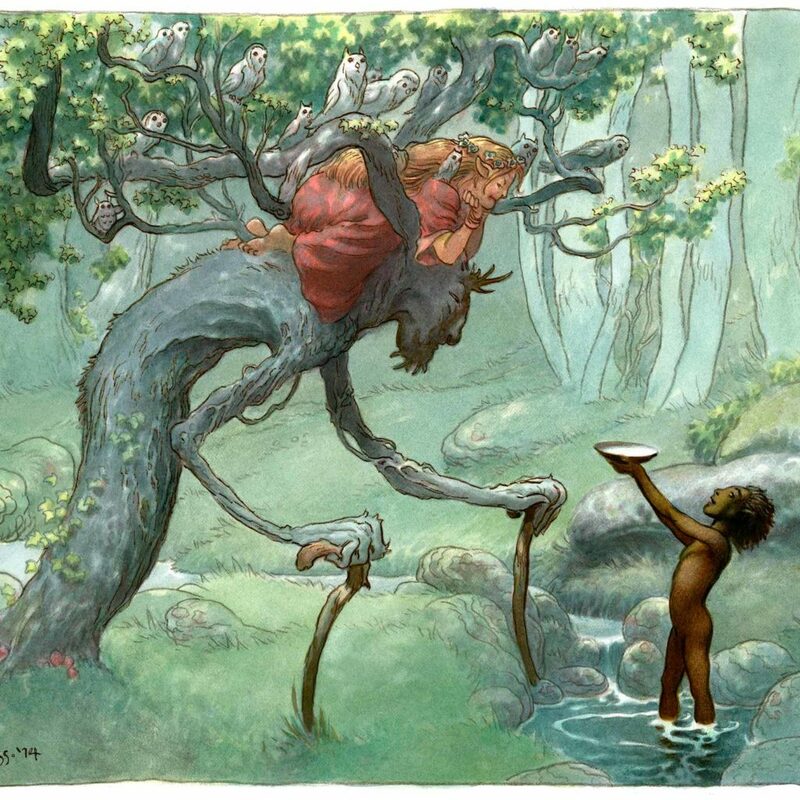 For over 10 years Charles’ work was featured in various comic book publishers including Marvel (Spider-man, Raven Banner), DC (Books of Magic, Swamp Thing, Sandman) and Dark Horse (Book of Night). One epic result was a Spider-man graphic novel “Spirits of the Earth” (1990) that he wrote, drew and painted. 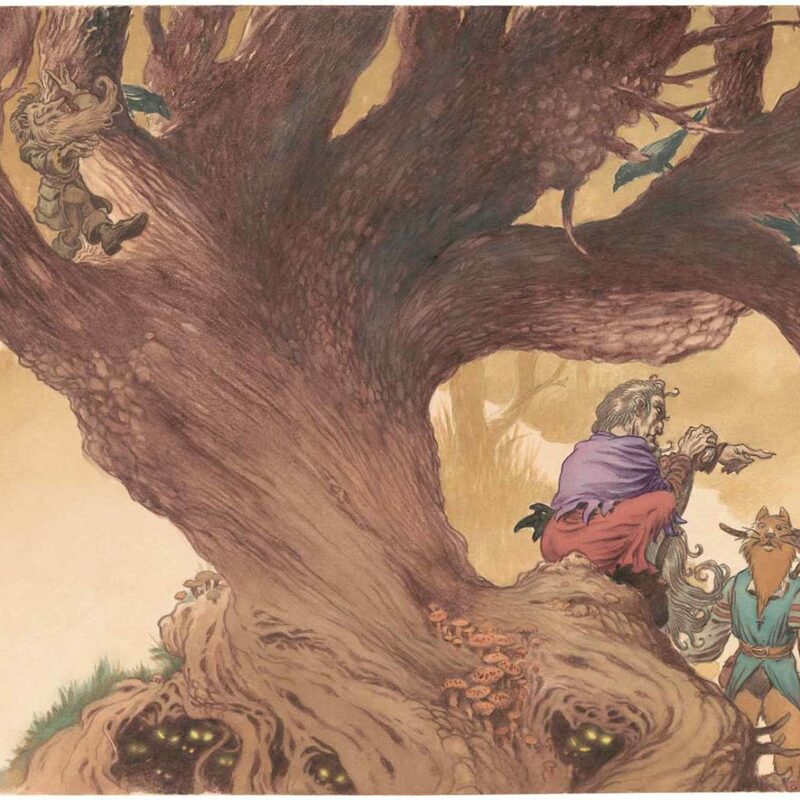 Since then his artwork has moved more into book illustration and he continues to win accolades and praise with his detailed, ethereal, light-and-shadow infused work. Charles’ art has been featured in many gallery and museum exhibitions across the nation, as well as Spain, Portugal, the UK, Italy and France. His work was included in the first major exhibition of Science Fiction and Fantasy Art at the New Britain Museum of American Art in 1980. “Ancient Spirit, Modern Voice: the Mythic Journeys Art Exhibition,” (DeFoor Art Centre, Atlanta, 2004) was co-curated by Vess and his wife, Karen Shaffer. 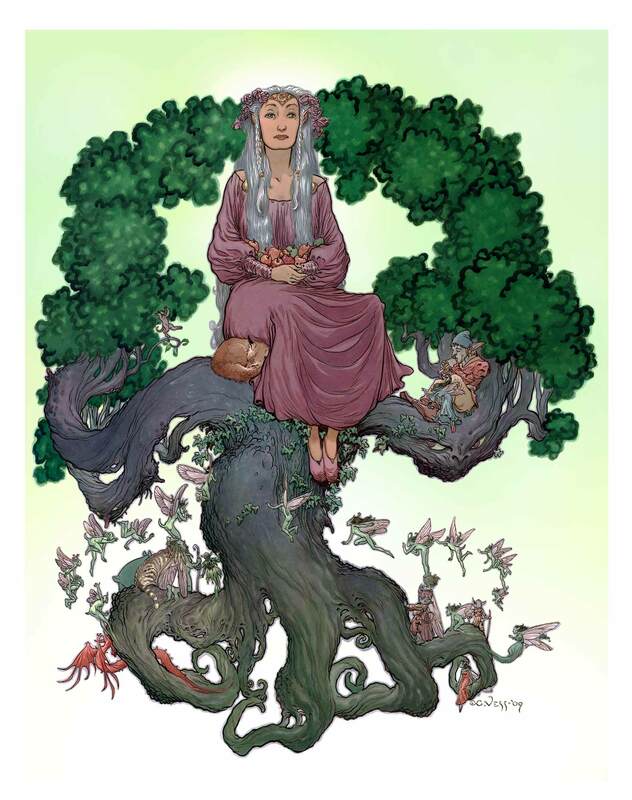 This exhibition (and full-color catalog) featured an international roster of over 22 artists, including Alan Lee, Brian Froud, Wendy Froud, Terri Windling, Mayumi Oda, Helena Nelson-Reed and Roxanne Swentzell. “Dreamweavers,” William King Museum of Art, (some traveling), 1994-95. 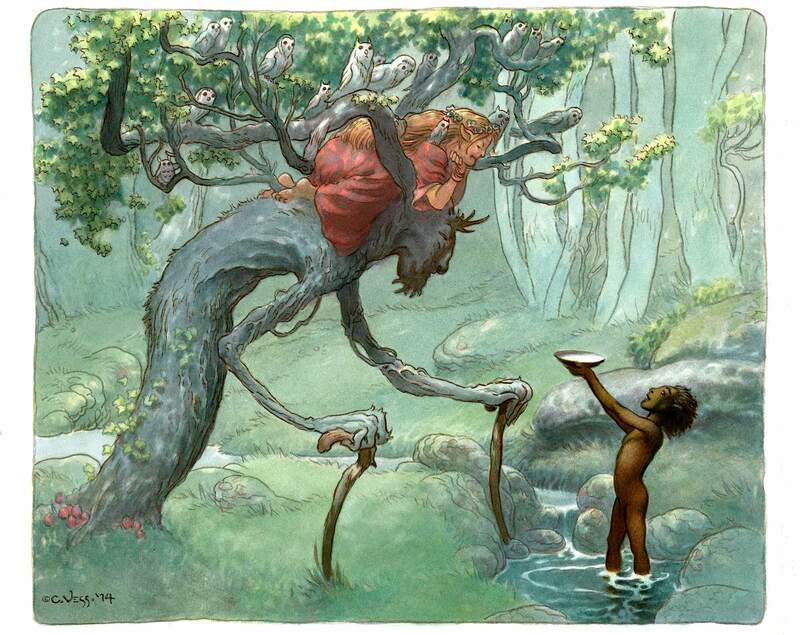 “Modern Fairy Tales” with Michael Kaluta at the Museum of Comic and Cartoon Art, NYC, 2005. “Spectrum: The Best in Contemporary Fantastic Art” at the Society of Illustrators, NYC, 2005. Daniel Maghen Gallery, Paris, France, 2010. “Into the Green” (a career retrospective), William King Museum of Art, Abingdon, VA, 2015. “Earthsea Imagined,” Massillon Museum of Art, Massillon, OH, 2018. Over the course of his 45-year career Charles has won the Ink Pot Award for Excellence in Comic Art (1990), the prestigious World Fantasy Award (4x) – once for Best Short Story with Neil Gaiman for Sandman #19 (DC Comics, 1991) – the Will Eisner Comic Industry Award (2) for Best Penciler/Inker for his work on his self-published The Book of Ballads and Sagas (1997) and DC’s Sandman #75 (1998). 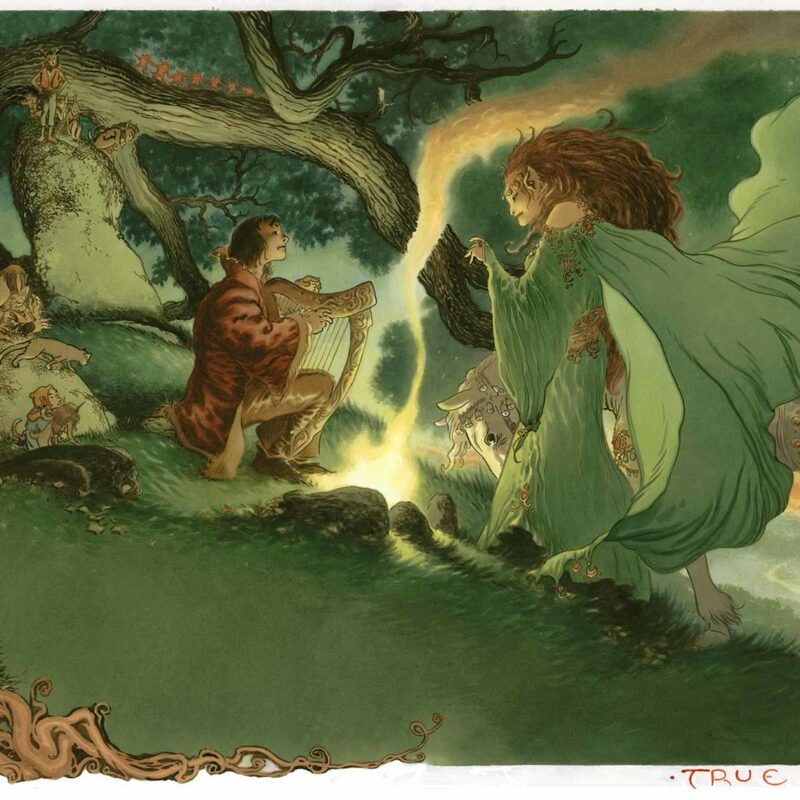 His work for Stardust, a novel written by Neil Gaiman with over 175 lavish illustrations brought him a second World Fantasy (Best Artist) as well as the Mythopoeic Award for Best Adult Literature for both Vess and Gaiman. 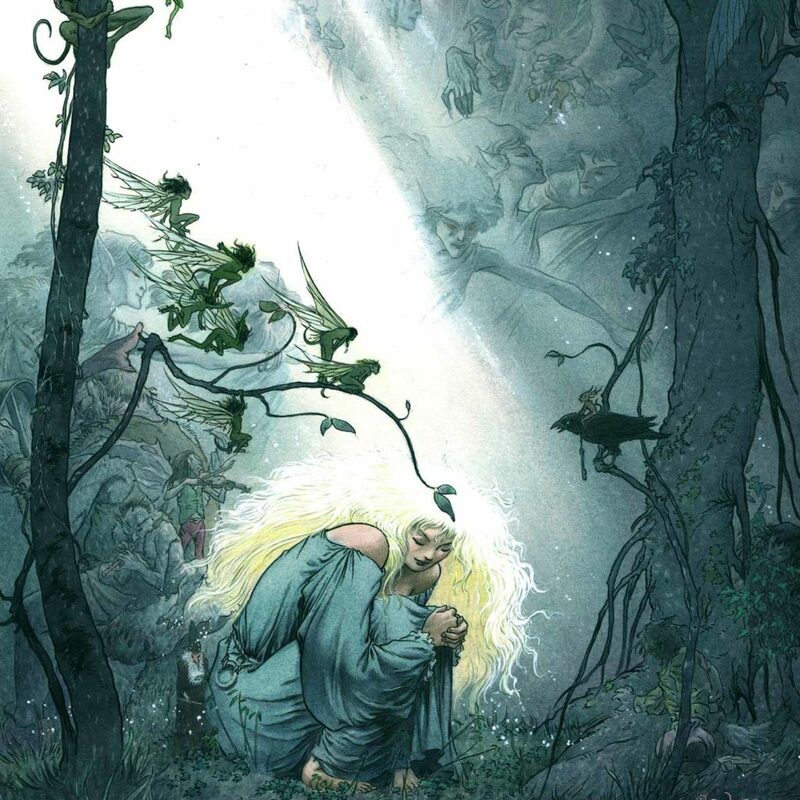 In 2002 Charles won a second Eisner for Best Painter for his work on Rose, a 130-page epic fantasy saga written by Cartoon Books’ Jeff Smith. 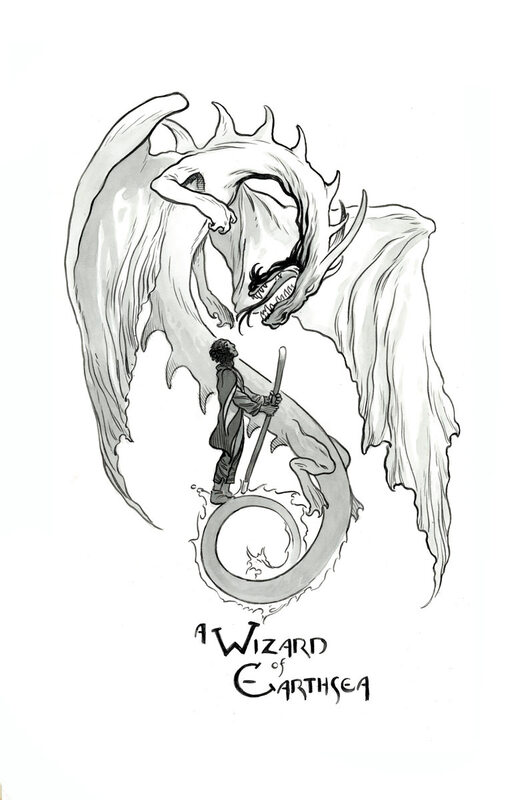 Two Chesley Awards (2005, 2006), two Locus Awards for Best Artist (2008) and Best Art Book (2017) and two more World Fantasy Awards for Best Artist (2010, 2014) have followed. Other accolades include two books that made the 2003 American Library Association’s list for Best Books for Young Adults. Seven Wild Sisters (Subterranean Press) and The Green Man: Tales from the Mythic Forest (Viking), both utilizing cover art and interior black and white were honored. 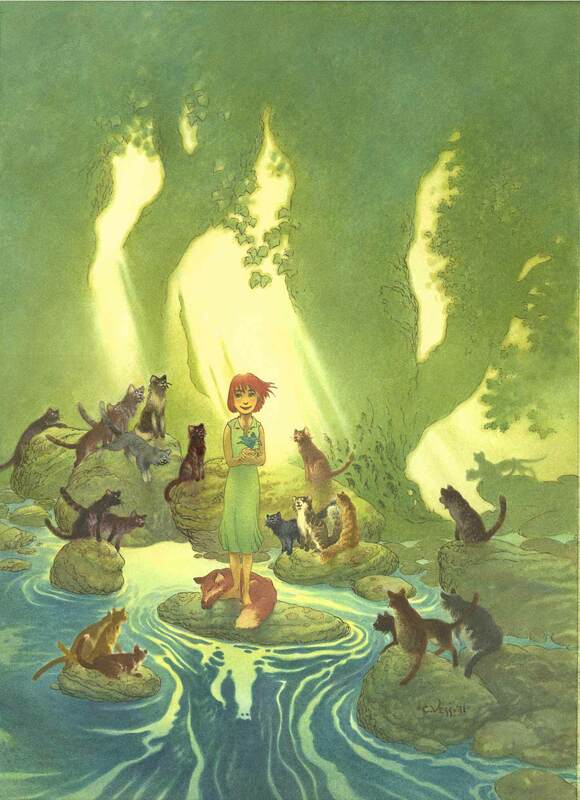 He also collaborated again with Charles de Lint on his first children’s picture book, A Circle of Cats (Viking, 2003). The cover art won the Gold Award for Best Book Art in the 10th annual “Spectrum: The Best in Contemporary Fantastic Art” show. 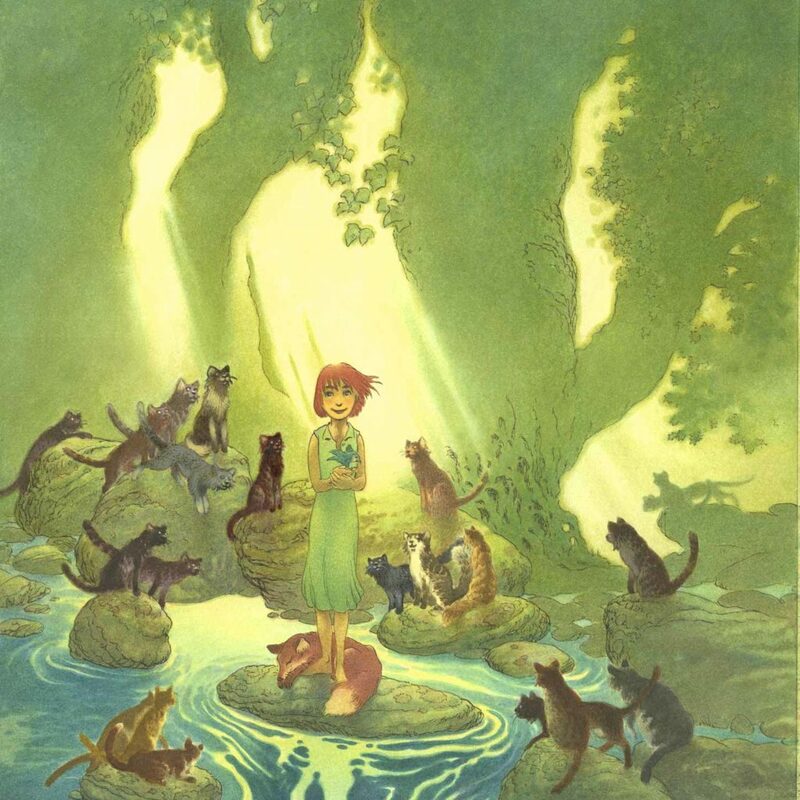 Ten years later deLint and Vess revisited and expanded A Circle of Cats, producing a middle grade novel, The Cats of Tanglewood Forest (Little Brown, 2013). 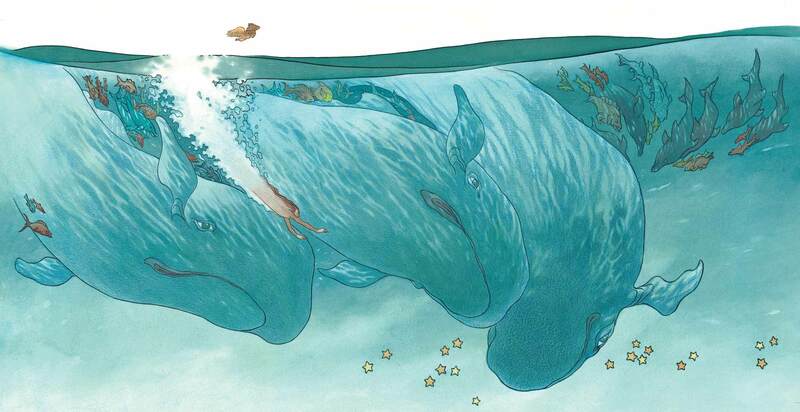 This was followed the next year with a full-color edition of Seven Wild Sisters, also for Little Brown. A delightful new edition of Peter Pan (Tor/Starscape) featuring a cover and over 30 b/w interior illustrations by Vess was released in the fall of 2003. Another collaboration with de Lint, Medicine Road (Subterranean Press), and the Datlow/Windling edited YA anthology The Faery Reel: Tales from the Twilight Realm (Viking) were published in the summer of 2004. This collection was subsequently followed by two more anthologies, Coyote Road (2007) and The Beastly Bride (2010). 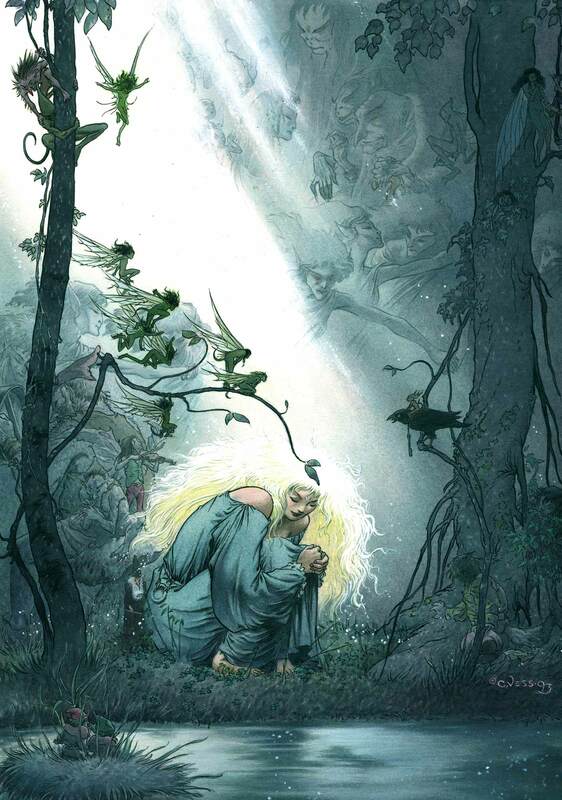 In the fall of 2004 Tor Books released The Book of Ballads, which adapted 13 Scottish and English ballads into graphic narrative form. Charles illustrated and scripted these with notable authors including Neil Gaiman, Jeff Smith, Sharyn McCrumb, Jane Yolen and Emma Bull. 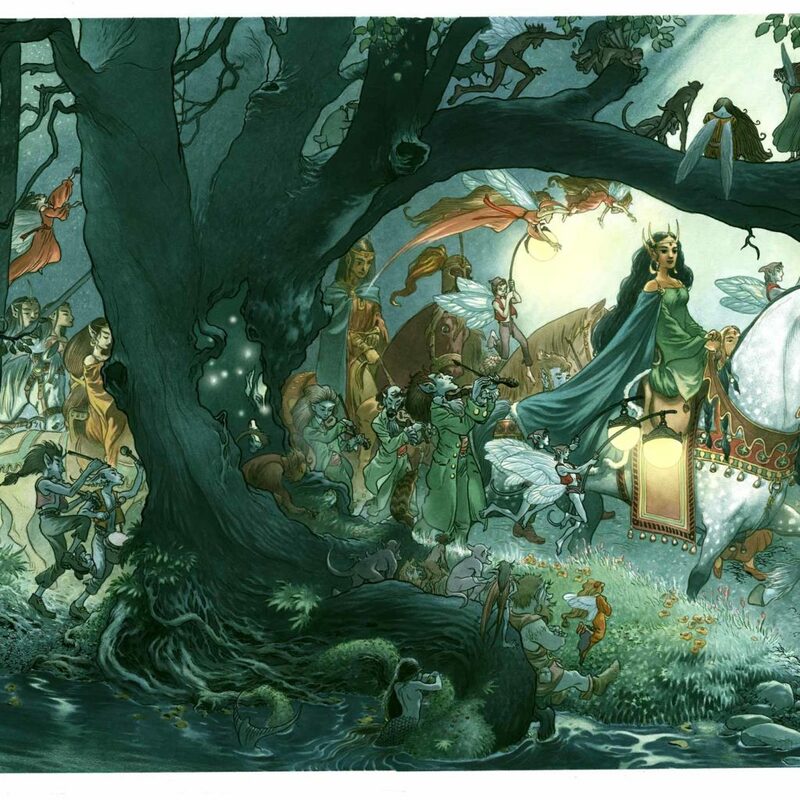 Vess lovingly produced a dozen color paintings and many b/w vignettes for the 20th anniversary edition of Charles de Lint’s seminal urban fantasy novel, Moonheart (Subterranean Press) in 2004. Then he was at the drawing board for the 2006 releases of a limited, slip cased, signed and numbered edition of George R. R. Martin’s A Storm of Swords (Subterranean) with 75 interior illustrations, and Susanna Clarke’s short story collection, The Ladies of Grace Adieu (Bloomsbury) with numerous b/w interiors. 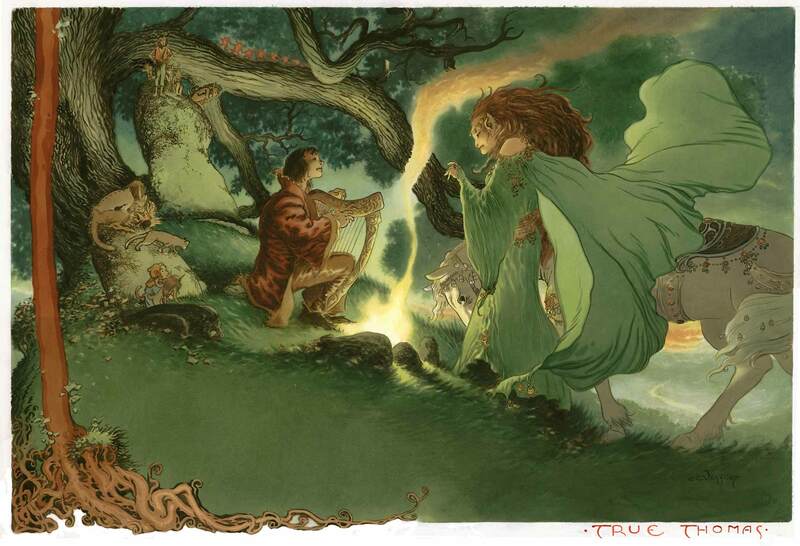 In 2007, the Gaiman/Vess collaboration “Stardust – Being a Romance Within the Realms of Faerie” (Vertigo/DC Comics, 1998) was made into a film by Paramount Pictures. The impressive cast includes Michelle Pfieffer, Robert DeNiro, Clare Danes, Rupert Everett, Charlie Cox, Peter O’Toole and Sienna Miller and was directed by Matthew Vaughn. At the same time Charles began work on an outdoor fountain sculpture, A Midsummer’s Play for the State Theater of Virginia, the Barter, in Abingdon. This was a 16’ foot bronze featuring Titania and Puck interplaying with the masks of Comedy and Tragedy along with a few creatures from faerie. After three years of hands-on involvement, including a major part of the clay and wax sculpting, pouring the bronze and overseeing the welding of a 3-D puzzle together, it was unveiled in November of 2009 in across from the theater. Other local Virginia public art projects include a 30 x 50’ interior wall at Southwest Community College in Richlands depicting the famous Jack Tales, and an etched stainless steel portal that is a tribute to Bristol’s music and transportation heritages at their public library. 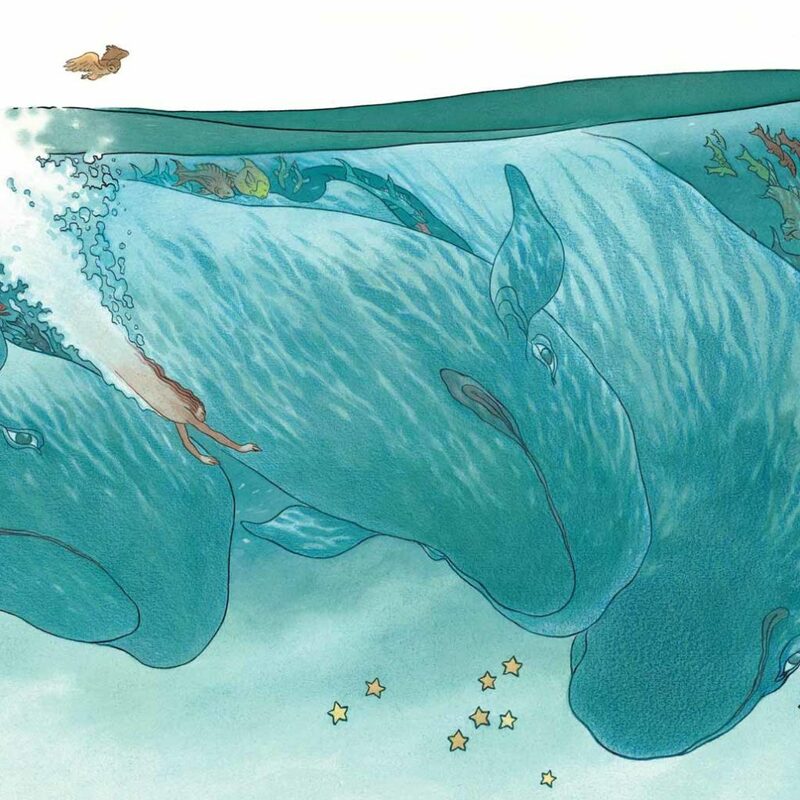 Two picture book collaborations with Neil Gaiman followed and became NY Times bestsellers, Blueberry Girl (2009) and Instructions (2010) both from HarperCollins. Two artbooks featuring Charles were published in 2009 “Modern Masters, Vol. 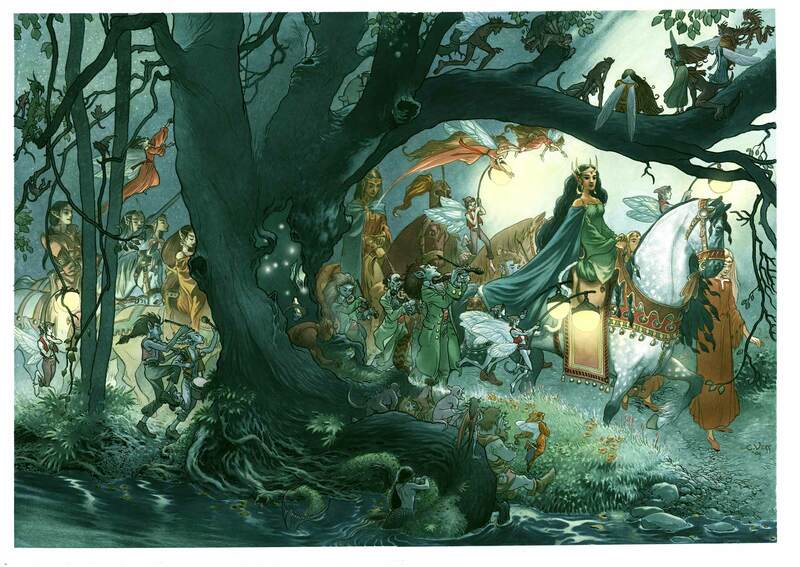 11, Charles Vess” (TwoMorrows); and “Drawing Down the Moon, The Art of Charles Vess (Dark Horse Books, 2009). 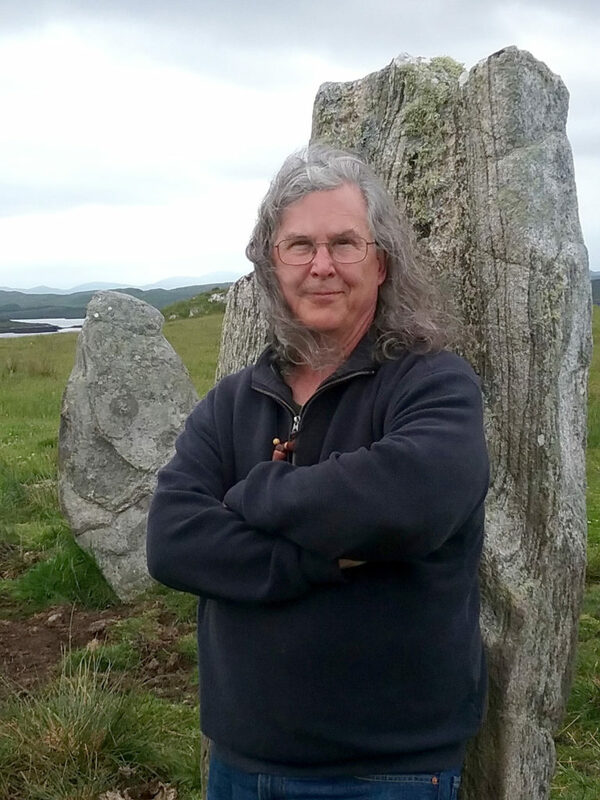 In 2016 Charles choose to publish his own book of art and poetry through a friendly small press, Faerie Magazine. 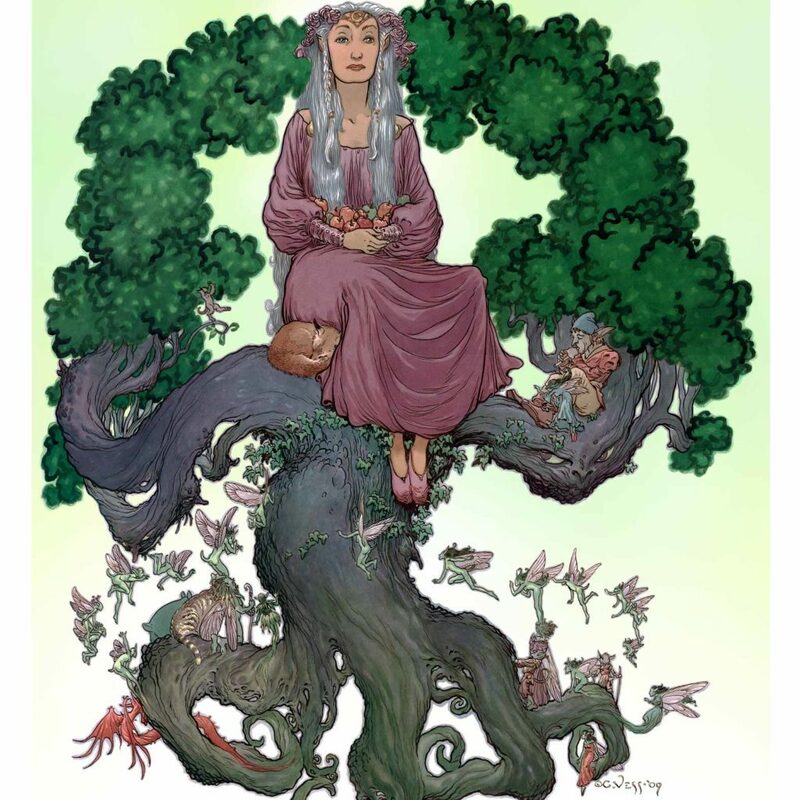 Walking Through the Landscape of Faerie, a guide to how he views the world we live in, features his art accompanying poems by Neil Gaiman, Jane Yolen, Delia Sherman, Robin Williamson, Ursula Le Guin and others with an introduction by Charles de Lint. 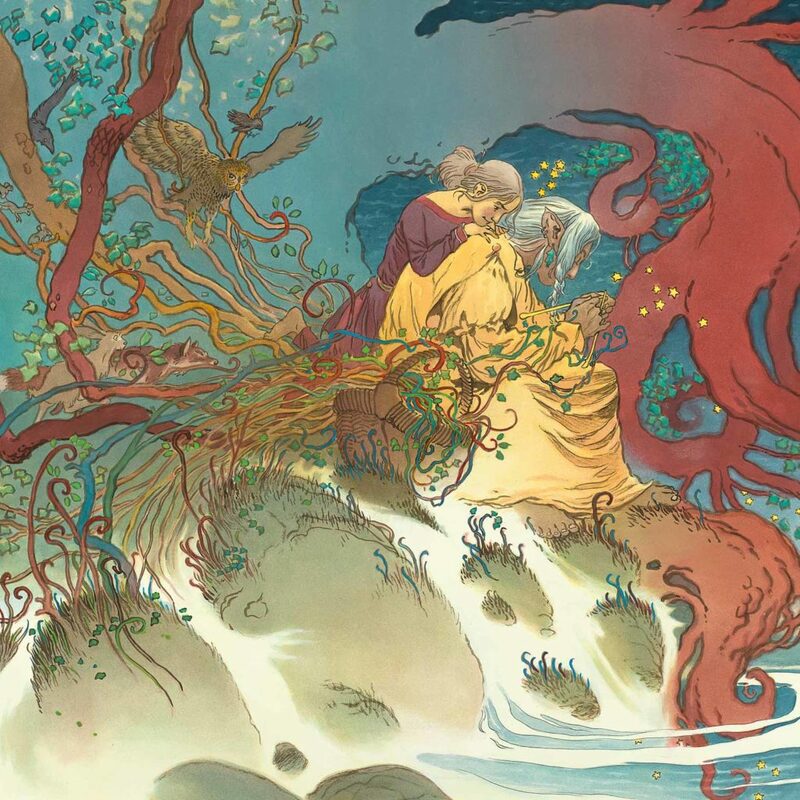 The Books of Earthsea was published by Saga Press in 2018 after four years of intense collaboration between Charles and author Ursula K. Le Guin. 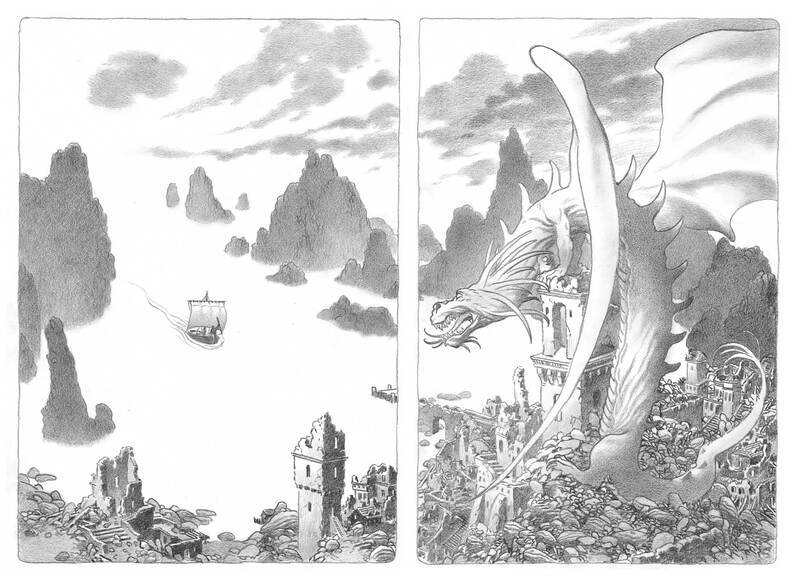 This 1000+ page tome features 56 color and black and white illustrations and is the definitive collection of all things Earthsea. Charles and his wife Karen live in the Appalachian foothills in a small farmhouse, in a small town, with 4 not-so-small cats. Charles’ favorite whiskies are the Scottish Highland single malts (esp. the Dalmore 15 or Macallan 18) if you want to get him talking.